Renault Trucks, a strong truck brand with roots from a big French car manufacturer. 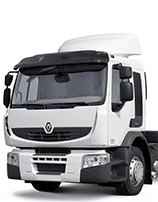 Used Renault Trucks are always a good choice for transport companies. The key values of Renault Trucks are efficiency, value and quality. Driving a used Renault tractorhead or truck provides an optimal output and ideal performance, while the impact on the environment is as low as possible. Besides that, Renault always strives to have the lowest prices and highest quality. They managed to maintain these values with success for 110 years already. Because of this fact, we at BAS Trucks believe that used Renault tractorheads or trucks are a perfect solution for your transport demands. Used Renault trucks are very popular, especially in Southern-Europe and South-America. We can transport and ship used Renault tractorheads to any destination in the world. Our transport fares are very competitive, just ask our sales persons for the latest prices. We can ship your used Renault truck by boat or by road transport. Feel free to call us, or leave your number behind. We will always call you back on short notice! 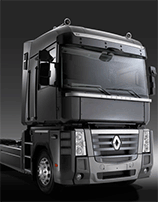 Maybe you are more interested in new Renault trucks instead of used ones. On regular basis, we have new or newly used Renault tractorheads in stock. Because these prices are higher than used trucks, it can be hard for logistics companies to purchase one. BAS Trucks has a solution for this problem. We offer truck leasing in 14 European countries for trucks which are not older than 5 years. It allows you to acquire a new Renault truck. Let our lease department inform you about all truck leasing possibilities. The Renault Premium (although not in production anymore) is still a great choice when it comes to used Renault trucks. It’s a very versatile truck and best known for being a full-service long distance cruiser. The combination of a large glass area with a high seating position provides a lot of advantages to the driver. The interior of the truck is very solid, up to the job and with no frills. The purchase price is very attractive in the used-truck market. The flagship of Renault Trucks was first manufactured in 1990 and discontinued in 2013, but is nowadays still immensely popular in the used truck market. Its design is very straightforward: you hate it or love it. Despite the huge engine power, fuel economy is better at rival trucks, but this is well compensated when it comes to durability. Renault Magnum trucks are very all-round and a perfect price-quality choice for all logistics companies.